This was a covered and airy storage for charcoal in foundry settlement Stara Sava. It is shown in the land registry map (1868) that in 1808 the original small building was extended to three connected storages. The buildings were right next to the blast furnace, supplying it with the charcoal as fuel. At the end of the 19th century the blast furnace was abandoned and the purpose of the storage was changed. In 2009 the Municipality of Jesenice renovated the only preserved storage and made two halls. 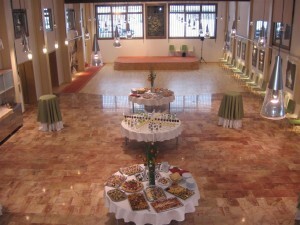 The conference hall on the first floor has 80 seats and 20 tables. It can be rented for various lectures, round tables, workshops, seminars… . It is equipped with projection facilities, a portable loudspeaker system and internet access. The Banquet Hall on the ground floor houses occasional exhibitions. It can take up to 180 people, there are 9 banquet tables, a catering kitchen and projection equipment with a loudspeaker system. It is suitable for various cultural events, meetings, conferences and symposiums and also for civil wedding ceremonies, personal celebrations and wedding parties.